Local admin accounts are privileged accounts. If a local admin clicks on a malicious link and downloads malware, their workstation could become “patient zero” in a catastrophic attack. When hackers gain privileges on one machine they can progress through your network and even cover their tracks by changing event logs. Privilege Manager automatically removes admin rights from domain and non-domain managed endpoints, including hidden or hard-coded credentials—so that virtually all critical vulnerabilities are mitigated. And because it uses policy-based controls to elevate applications without requiring admin credentials or requesting IT support—it enforces least privilege while maintaining user productivity and minimizing help desk calls. 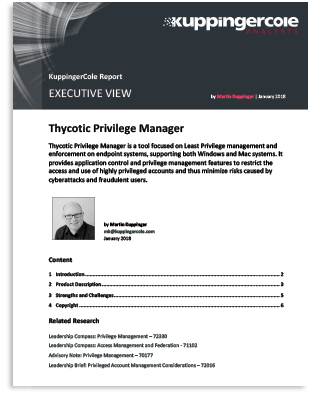 See why KuppingerCole recognizes Thycotic Privilege Manager as a mature, simple and straightforward solution that restricts privilege elevation for applications and underlying processes without impacting user productivity. Thycotic Privilege Manager is a mandatory addition to traditional Privilege Management solutions, which lack the support for the specific requirements of Endpoint Privilege Management. 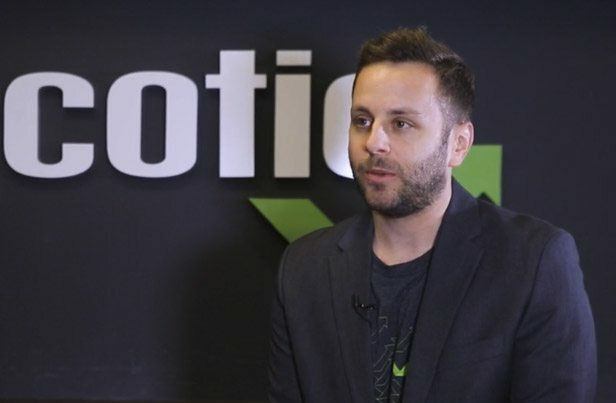 Join Thycotic Product Manager Steve Goldberg as he explains how you can implement least privilege to protect confidential data, block malware, and meet compliance requirements, without slowing down users or requiring additional desktop support. This eBook explains how you can eliminate the risk of most malware attacks by implementing the security strategy of least privilege. 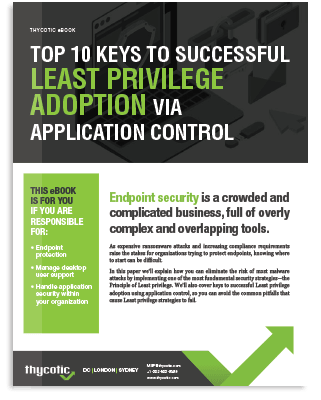 Discover the keys to successful least privilege adoption using application control, and avoid the common pitfalls that cause least privilege strategies to fail.